I live in eastern Massachusetts and I'm often asked questions about the Hammered Dulcimer from people in the area who are interested in acquiring, and/or learning to play the instrument. Here then are the questions I'm most frequently asked, along with my opinions and answers. I've also included links to other pages or email addresses where more information is available. I hope this provides a good starting point if you are interested in this beautiful and fascinating instrument. Towards the bottom of this page are dulcimer-related questions I often get from more advanced players. What do I need to get started playing the Hammered Dulcimer? hammers, ~$20-40 (one pair usually comes with a new instrument). There are various styles, weights, balances of hammers. You'll probably acquire a collection of these over time, with one or two sets that you'll favor and use most of the time. Most people have at least one set of soft hammers (padded on the striking surface with leather, suede, rubber, etc. ), one pair of hard hammers (just wood), and one pair of double-sided hammers (soft on one side and wood on the other). Festivals are a good place to find and try out new hammers, and to swap hammers that you didn't really like when you got home with someone else in the same situation. a tuning wrench, ~$12-15. One usually comes with your instrument. There are two types: gooseneck and T-wrench. They both work fine, just make sure (if you are buying one) that it properly fits the pins on your instrument. Ones with a star pattern are preferable to those with a square hole. a case for the instrument, ~$50-300 depending upon the size and features. Most these days are soft cases made from well padded Cordura nylon. They protect the instrument when inevitably banged into something while being carried. Its thermal insulation (from the foam padding) also helps the instrument stay in tune as it's carried through indoor and outdoor temperature changes. If you will travelling much with your instrument I recommend spending the money for a good case. These are NOT cases you can check as luggage when flying, which are heavier and more expensive. a stand, $50-200. I recommend one that is adjustable for playing both sitting and standing, and where the instrument angle can be adjusted to suit your physique and playing style which usually cost around $150-200. an electronic tuner, ~$15-80. Unless you enjoy spending hours tuning your instrument you'll want one of these. Make sure it's chromatic (even if your instrument is not) - don't get one made for guitars (that only tunes 6 notes). Also be aware that some tuners can be too sensitive (making it difficult to determine what is exactly in tune - strings change pitch after being struck), or take too long to determine what note it hears. 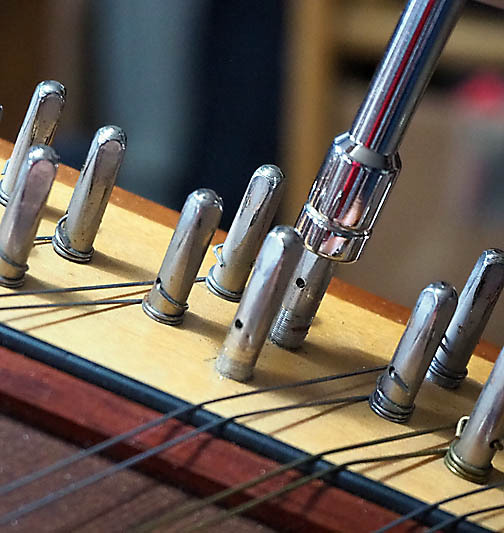 I've also found some tuners that work fine on single stringed instruments (like guitars) have a more difficult time with double/triple stringed instruments like hammered dulcimers and mandolins. Best advice is to borrow one you're interested in trying out, either from a friend or a vendor at a festival. Early on I brought my instrument to a local music store to try out various tuners there, and actually got my first paying gig from a person who watched me there. The tuners I find work best are made by the companies Snark, Sabine and Boss. Many people use Korg tuners as well. The current favorite for most players (including me) is the convenient and inexpensive clip-on Snark SN2 or SN8, which eliminates the need for a separate clip-on pickup (vibration sensor). I also recommend (unless you have a Snark) getting a clip-on pickup if you can (~$10-18) - otherwise you're likely to discover the pitch of your refrigerator motor, the traffic outside, etc. Don't get the suction cup type of pickup - it's really just a microphone, not a vibration-sensitive transducer. a humidifier for winter use if you live where it gets cold (like New England and other northern climes) and your house gets dry (less than 35% humidity). If you're not sure of your humidity level in the room where you keep your instrument get yourself a hygrometer. I recommend getting a humidifier that holds at least 1-3 gallons of water and has a humidstat that will turn the unit on and off as needed to maintain a set humidity level. I prefer the warm mist type (no white mineral dust deposits and no smells from mold/bacterial growth) and I have two of these units in the large room where my wooden instruments live (dulcimer, guitar, bass, mandolin, marimbula, wooden drums, etc.). Both humidifiers need to be refilled daily and need to be cleaned every 1-3 weeks (your frequency will depend upon the hardness of your tap water). In the winter, without a controlled humidity environment your soundboard can dry out and crack. This seems to be much more prevalent with unibody/glued-soundboard constructed instruments, especially Dusty Strings models. Where can I buy a Hammered Dulcimer? Unfortunately there are no local places in eastern Mass to buy instruments anymore that I know of. Most people these days buy their instruments directly from a builder or from a vendor at a dulcimer festival. Sometimes you can find used instruments for sale on your local Craigslist. If you have a dulcimer player to accompany you when you check then out in person that will help you avoid instruments with problems. What types of instruments are there? 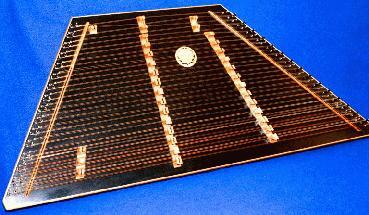 Dulcimers tend to be classified by size, type of construction, and diatonic or chromatic. Standard dulcimer sizes are 12/11 and 16/15. These numbers indicate the number of courses (sets of strings that are tuned to the same note(s)) on the treble and bass bridges. Numbers larger than this usually indicate an extended range dulcimer and/or one with the addition of chromatic notes (that don't appear in any of the diatonic scales nearby on the instrument). If you see an instrument that has more than two numbers (like 17/16/8) this indicates there is a third bridge (the 8 in this example) which is usually has extended bass notes and/or bass chromatic notes. Diatonic instruments contain multiple 8 note diatonic scales (do-re-me-fa-so-la-ti-do) in different keys, allowing you to easily play most tunes and songs in those keys. Chromatic instruments add notes above and/or below the standard bridges with notes not found in the nearby diatonic scales. These additional notes can enable you to play more complex tunes (ie. classical and jazz) and traditional tunes that have accidental notes in them. However to play these notes often requires inconvenient long reaches and other hammer gymnastics. Pictures of each type and description appear below. You can click on each picture for a more detailed enlargement. I've owned several of each type and so will offer my observations. Also note that some builders make or have made instruments of both types. Probably most dulcimers made today are of this type. These feature a clean look since the soundboard extends to the edge of the instrument covering the pinblocks. Most (if not all) have two strings per course on both the bass and treble bridges. 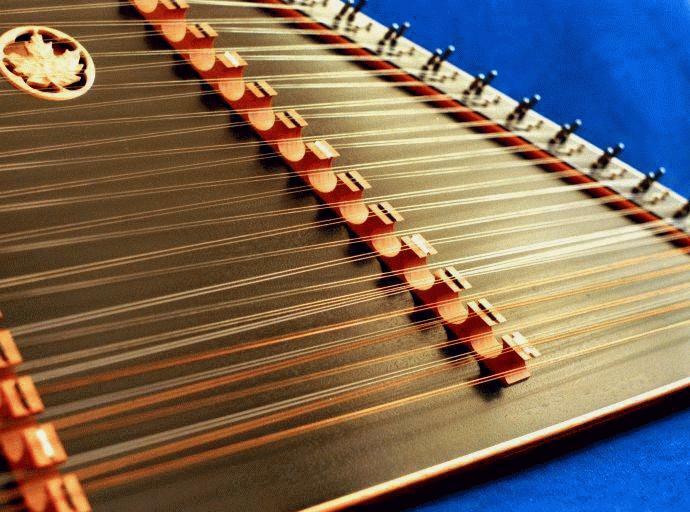 Builders of this type of dulcimer include Sam Rizetta, Dusty Strings, Jerry Reed Smith, James Jones, Folkcraft Instruments, Masterworks/Russel Cook, Songbird (Chris Foss), David Lindsay (David's Dulcimers), and many others. With this style of instrument the sound board sits inside of a frame, which includes the pinblocks which is usually exposed. 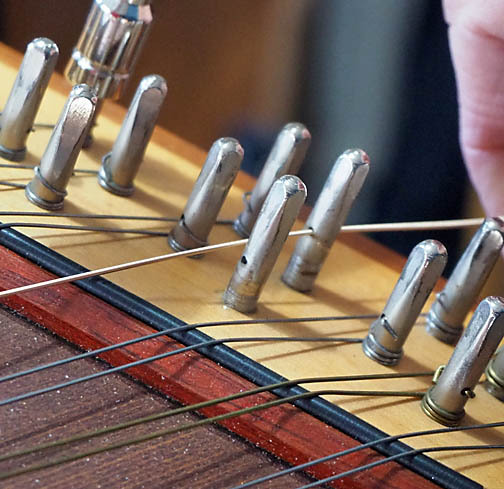 The soundboard is held in place by the tension of the strings on the bridges and is free to expand and contract. Proponents of this type claim that the sound is "better" since the soundboard is not constrained as much as with unibody/glued-soundboard construction. Builders of this type include David Lindsay (David's Dulcimers) Michael Allen (Cloud Nine), and Bob Tack. These instrument can come with 2 or 3 strings per treble course (the instrument in the picture above has 3 strings), and most have 2 strings on the bass courses. I've found that they indeed can be louder (but not always), and do seem less susceptible to going out of tune due to temperature and humidity changes. Depending upon the type of wood used for the soundboard, many have a sharper sound that I find "comes through" better when playing with other instruments (especially fiddles). What size/type of instrument should I buy? Rent one - great in theory but difficult to find in practice. Very few teachers have extra instruments they offer to rent to their students. I don't know of any store that rents dulcimers. Purchase a used instrument - used instruments can be hard to come by. If you can find one and can have someone who knows something about dulcimers check it out for you, this can be a good, less expensive way to get your feet wet. Festivals are often a good place to find and try out used instruments. Be careful of instruments with non-standard (i.e. not 5th interval) tuning, or structural problems (cracked soundboards or pinblocks, etc). Buy a 12/11 model - this is how I got started. These instruments are smaller, lighter, and have fewer strings to tune. Models can range from inexpensive beginner models to rather good sounding ones that you'll be pleased with after you've become proficient. Figure on spending about $500-800 for an instrument with a case and a stand. Buy a 16/15 model (if you can afford it) - this 3 octave instrument will provide you with more playing options, has a fuller sound, and will probably be the size instrument you'll want after you've learned to play on a 12/11 instrument. Prices start around $600-800 for beginner non-chromatic models, and some packages include cases and stands. I used to recommend NOT starting out with this type of instrument because they were much more expensive than the 12/11 ones. My rationale was that after you've learned to play and started listening to other instruments, you'd probably discover a particular instrument or builder or model whose sound you really liked. You'd then be in a much better position to move up to a 16/15 you'd be happier with for a long term relationship, and could better decide whether you wanted or needed a chromatic instrument (even more $$$). However given the small price difference these days and the number of good beginner 15/14 or 16/15 instruments and packages, I now recommend starting out with one of these larger instruments. It will sound better, you won't soon outgrow it, and it will have better resale value should you later find an instrument whose sound you fall in love with (or you decide you want a chromatic instrument). Do I need to read music to play the dulcimer? No, but (I think) it helps, especially in learning new tunes. Keep in mind that picking out the notes of a tune on the strings is important, but so is playing fluidly and rhythmically. If you don't currently read music it is not difficult to learn. Where can I get lessons in the area? I seem to be the only person left in the area who gives lessons. See my Lessons page re: prices, availability, teaching methods, etc. Are they any regular hammered dulcimer clubs/gatherings in the area? There used to be one but it seems to have faded away. Any takers? Are there any dulcimer festivals or camps in the area? Are there any publications for dulcimer players? What other Hammered Dulcimer resources are on the internet? Check out EverythingDulcimer.com, although these days it seems to be more oriented to mountain dulcimers. How do you change a broken loop-end string? 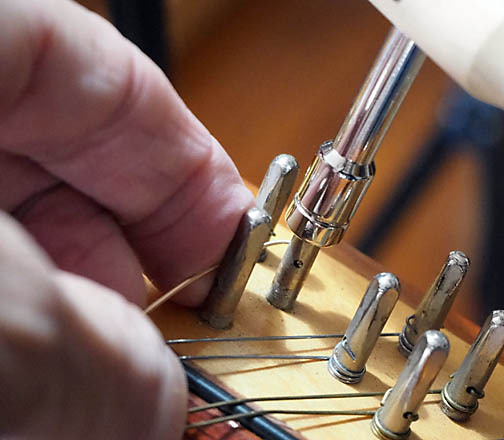 There are a couple of methods to put on a new string, but here's a popular standard method which is what I use (and which does not require any special tools). It's simpler than it may seem from these detailed instructions. I suggest first reading thru all these steps once before starting the process, and then following each step in order. You can click on any of the pictures below for an enlarged image. 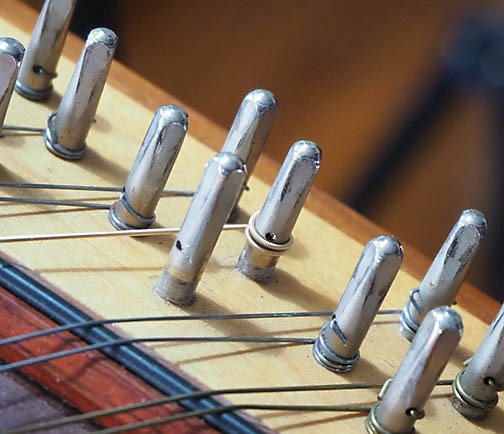 NOTE that on this dulcimer a single string is used for both strings per course, so breaking one string affects both courses. 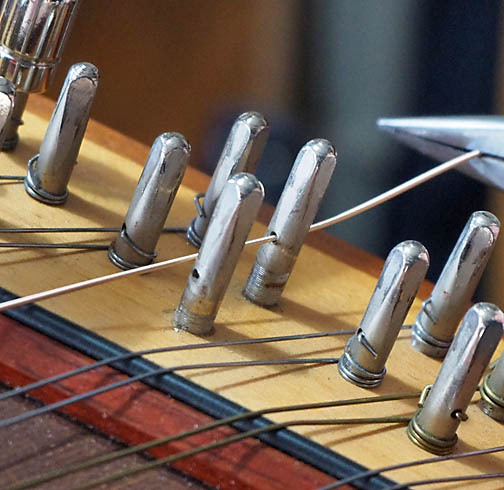 Here we're replacing one note's single steel string with two individual loop-end wound strings. And, a recommendation: unlike the example below, if you are changing both strings on a course I recommend doing the bottom-most string first and the top-most string second. 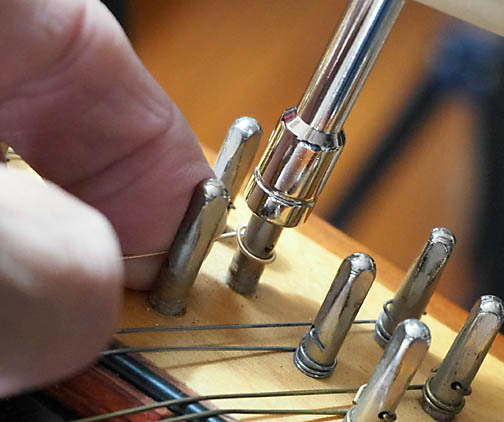 Otherwise the top string will interfere with your holding the bottom string against the tuning pin when it comes time to tighten up the bottom string tension. 6 For lighter weight strings use your needle-nose pliers to make a 90 degree bend at the very end of the string - approximately 1/8 inch long. 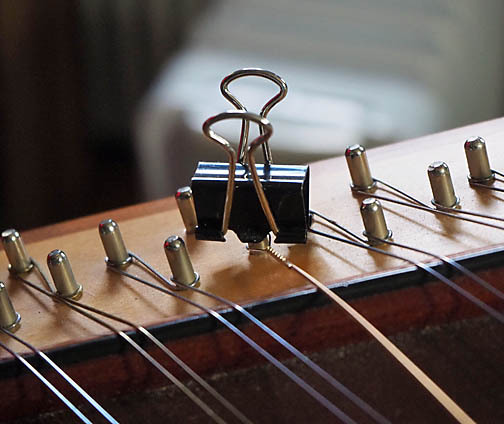 This will help keep the string from pulling back thru the tuning pin as you wind it down. This step is not needed for heavier or wound strings. 8 Put your tuning wrench on the tuning pin. 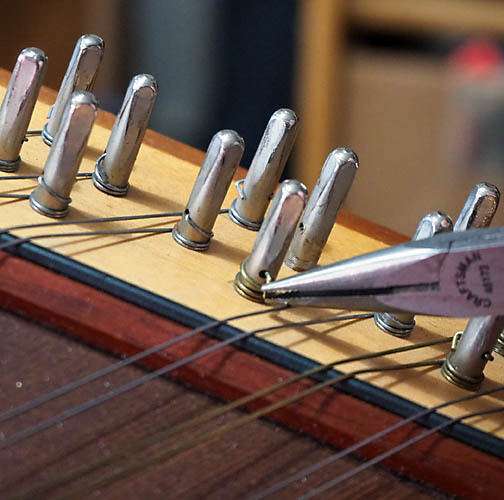 While holding the string taught against the side of the tuning pin with one hand, turn the wrench and pin (clockwise) with your other hand so the string wraps around the outside of the tuning pin with the windings going downward towards dulcimer. NOTE that it would have been easier and better to have done the bottom string of the pair first to allow for more room for my finger to hold the string against the side of the tuning pin. With the little room that I have I'm holding the string as close to the pin as I can and using the bent string as it goes around the outside of the tuning pin to maintain as much pressure as I can on the side of the tuning pin. The new string will stretch a little for a while as you play it (going flat), so you'll need to check it and periodically tune it back up to pitch until it stabilizes. This is normal. I notice you don't use a microphone when you perform on stage. 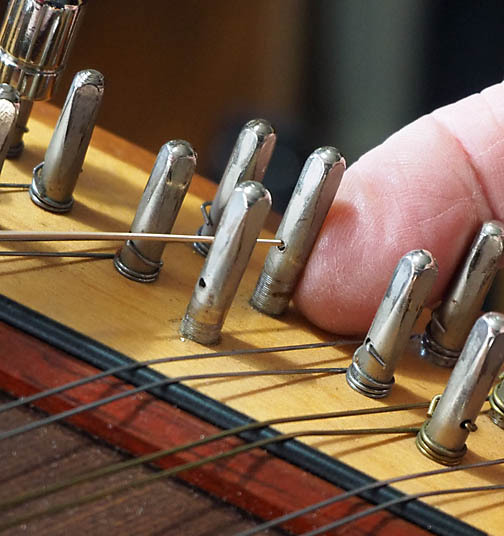 What kind of pickups do you use and how did you install them in your Hammered Dulcimer? 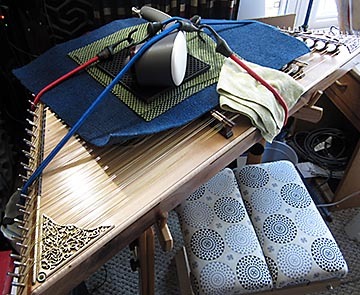 I use Pick-up-the-World or Schatten Design stereo HD pickups in my hammered dulcimers. Here's a document with everything you need to know about how I use them and how to install them if you are considering installing pickups in/on your instrument. I recently purchased a newly built hammered dulcimer. How should I "break it in" and how long will it take until it loosens up and sounds better/fuller/more resonant? Under normal circumstances it usually takes anywhere from 6 to 18 months of playing to break in a new dulcimer. Once broken in the instrument will sound fuller, louder and more resonant, and the strings will not feel so "tight". Here's a way to significantly speed up this process: attach a percussive massager with a variable speed control to your instrument for a week, and each day (preferabley several times a day) vary the speed/frequency so you end up vibrating all frequencies of the dulcimer. I've used this technique on both of my JRS dulcimers with great success, and in both cases it literally took many months off the break-in time. Here is a picture of what this looked like on my most recent one.